Markham Meadows is located off Markham Woods Road in the upscale Markham Woods corridor. 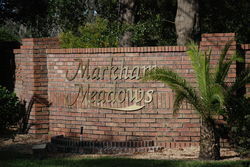 Originally orange groves and a nine-hole golf course, Markham Meadows was developed into a small well-kept 45 custom home community. All of the lots are over one acre. Restaurants, shopping and everyday conveniences are located nearby. The interchange of 434 & I-4 is within minutes for easy commuting.